Click on a book image for purchasing details. 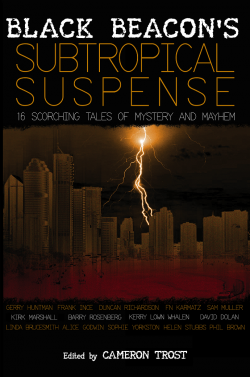 My story Downpour can be found in Black Beacon Books’ Subtropical Suspense. Stories of mystery and suspense set in Brisbane, Australia, I’ve been so glad to be involved with this project and there’s other great Australian writers involved. Support Australian endeavour. My children’s story, Manuka Mischief, will soon be published in The Best of Twisty Christmas Tales from Phantom Feather Press. It’s alongside stories from lots of incredible New Zealand writers (FFP is a New Zealand-based publisher) and I’m glad to have a children’s story out there. If after a pre-teen present this Christmas, check out the anthology’s PledgeMe campaign.